Fibrous Filter Media comprehensively covers the types, manufacture, applications, performance, and modeling of fibrous filter media. Part I introduces the principles of gas and liquid filtration, while Part II presents an overview of the types of fibrous filters, including details of fiber types, fabric construction, and applications. Part III covers a variety of filtration applications in which fibrous assemblies are used, with examples ranging from filtration for improving air quality, to medical filters, to industrial waste-water filtration. Finally, Part III covers the properties and performance of fibrous filters, including chapters on filter performance and simulation. 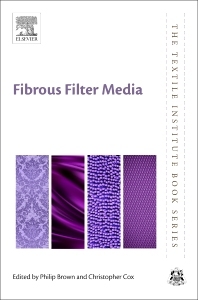 With its expert editors and international team of contributors, this important book provides information on fibrous filters relevant to fiber and textile scientists, and is also ideal for academics and industry professionals working in the field of filtration. Dr. Philip Brown is Sweetenburg Professor of polymer and textile engineering at Clemson University, USA. Dr. Christopher Cox is Professor of mathematical sciences at Clemson University, USA. Dr Christopher Cox is Professor of mathematical sciences at Clemson University. Modelling polymeric fiber and film processes is one of his key research interests, including modelling and simulation of fibrous filters.